& into the new human consciousness. 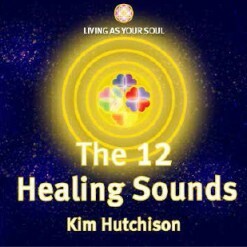 These 12 Healing Sounds of Creation are quite literally the vibrations of energy that have created your body, your presence here on this Earth. Without these vibrations you would exist only as your soul. These 12 Sacred Healing Sounds have come from your soul and are, of course, a part of the vibration patterns of the cosmos, which is why they are so uniquely powerful and will consciously connect you to your soul. expand within you and your life this new healing and creative power. We are all here to be living in the power and love of our souls. What this actually means is that your presence here on this Earth expands to encompass and embrace the memory of your soul. This, in turn, means that your cellular vibration (the drum beat of your life) expands to ‘remember’ wisdom once forgotten and so extend your powers of healing and creation. As Sufi teachings state, "Before its incarnation the soul is sound". These are those sounds. Making a regular (daily) practice of these new Healing Sounds of your creation will open up and expand your awareness and understanding of your Self, your healing opportunities and your feelings and behaviours. This will bring your memory (and thus your DNA) into healing, into your Love Pattern of Reality, which, in turn, helps you to easily and naturally be of your love to and with others, and with your Self. This is the ultimate in all forms of healing. Beginning or ending the day with The 12 Healing Sounds of your creation leaves you with more energy, tranquillity, strength and ease – and are a great way to begin your meditation practice. My students tell me how easy it is to fit the Sounds into their daily routine. Once mastered you can play the CD/MP3 whilst in the car, in the bath (I often do them in the shower), in bed or even when cooking. This last is a brilliant idea as all your food then becomes infused with this powerful healing energy. - step by step through each of the 12 sounds of your Receivers, (your energy centres). Or you can always just lie back and let the power of these healing sounds wash through you. To pre-order your CD or download version of The 12 Healing Sounds please enter your details below. Welcome to our community! Thank you for your pre-order. Details will be sent to you directly. In the meantime, I look forward to sending you the next in series articles and updates (please Subscribe to receive these). Please let me know (via Get In Touch ) about any other subject areas you would like to see on the site. Your feedback on any area is always welcome, it all helps me to be of better service to you. These powerful healing meditations take you into the state of the profound love of your soul. When you are in this profound state of love, healing and joy then you can feel/see/sense/know the answers to your questions and to your desires and so experience the profound understandings necessary for you to become your own healer, your own teacher of your life. And because these meditations bring your cellular vibration into your Love Pattern of Reality, spontaneous healing can and often occurs. You will experience the release of stress induced tension from your mind and body and find it easier to respond with serenity rather than irritation. You will notice that you are better able to receive and give love because you are better able to be of your love. Just imagine how you would experience your life if you felt loved, safe, joy. 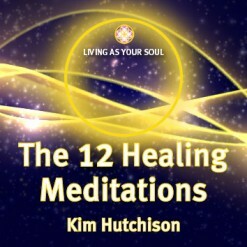 The 12 Healing Meditations follow on from each other to create a powerful healing journey, your journey of love, your journey of the love of your soul. - back into your body to realise and experience for your Self the healing that has been created in your body and mind. This also completes the soul-body-mind-body circle of healing creation. - on how to continue your healing meditation practice for your Self, so that you can continue to easily and effortlessly connect with your Place of Healing, anytime, any place, anywhere! My suggestion is that you repeat each meditation for 12 days (or for as long as your soul desires!) before you begin the next one. These are very powerful as you will experience for your Self, so step by step will give you your best results and experiences. To pre-order your CD or download version of The 12 Healing Meditations please enter your details below.